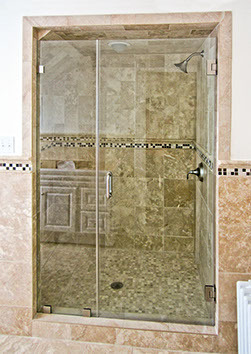 Making sure that your shower installation goes smoothly is our first priority. 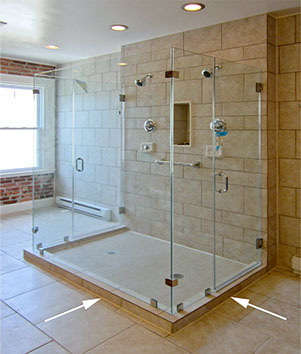 And since the shower glass is the last piece of your bathroom to get installed, it is important that you are set up for success. 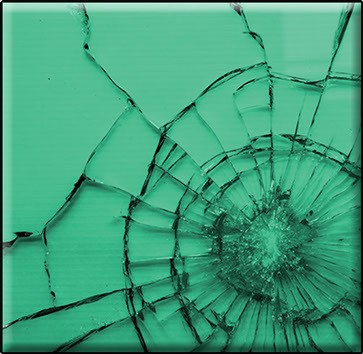 We want to help you keep the issues at bay and the costs down. 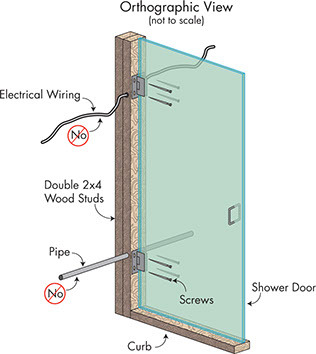 We suggest that you review these with your contractor so that together, you can be sure your shower installation goes off without a hitch. 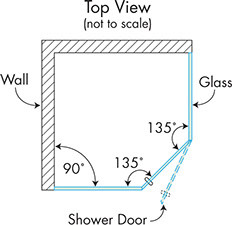 Shower Shape: The first place to start is the shape and size of your shower. 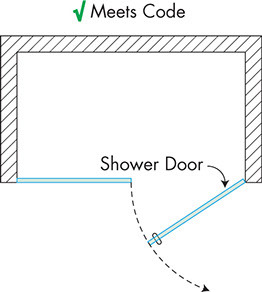 Shower Layout: Which way can the door open? 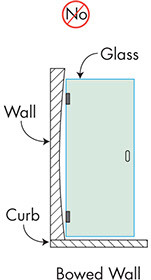 And what are "knee" walls? 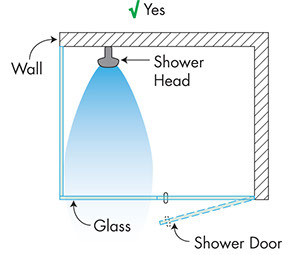 Shower Construction: What are the structural requirements, including the walls and position of your showerhead? 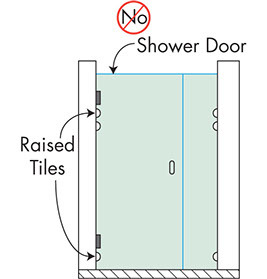 Shower Tile Installation: These tips are key in getting glass and tiles to "play nicely." 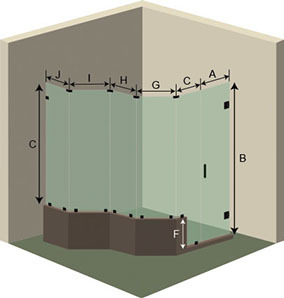 When designing your glass shower enclosure the first place to start is the shape of the shower. 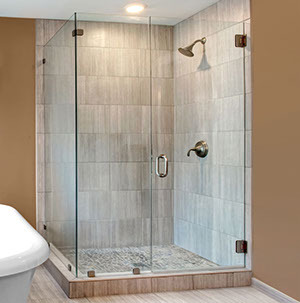 If you are remodeling your bathroom, you’ll have a little more leeway about choosing a shape of your shower, because different showers fit in different spaces. 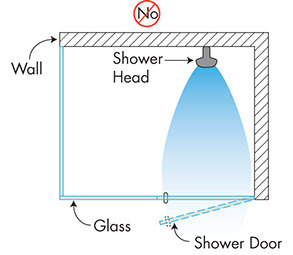 If you’re just replacing your shower with a new one, then you’ll generally need to keep the same shape. 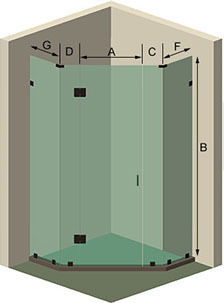 Neo Angle Shower – for slightly larger corner spaces that allow for a diamond shape. 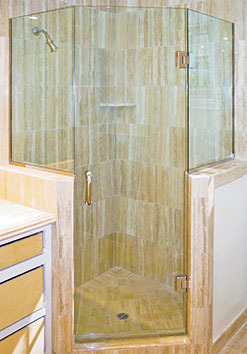 Custom Showers – for slightly larger corner spaces that allow for a diamond shape. 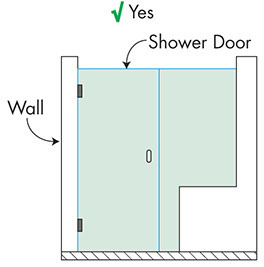 For more information on the shower layouts and shapes you can choose, please review our Shower Buying Guide. 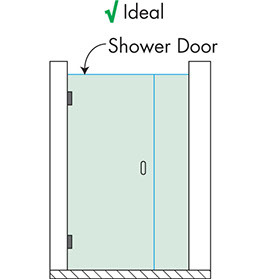 After choosing your shape, the following tips will help you meet the criteria for the best possible installation conditions for your new shower. 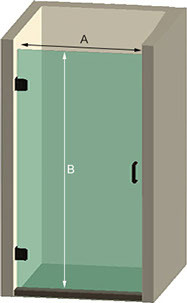 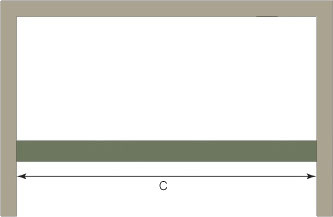 When planning your shower design, keep in mind that Building Code Requirement IRC P 2708.1 (2000 edition) states that all hinged shower doors must open outwards. 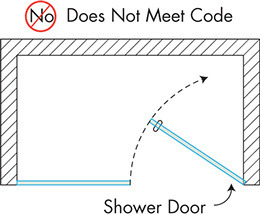 Hinged shower doors that swing inwards only are not permitted by code. 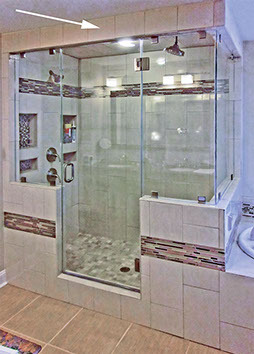 So, in your shower design, you need to make sure there are no obstacles, such as a toilet or vanity, that will prevent your shower from opening outward. 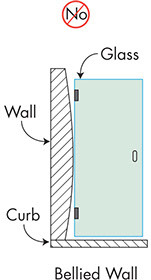 Curb or No Curb ? 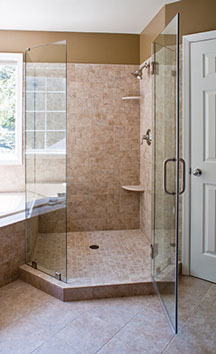 Decide whether your shower enclosure will be installed on a "curb" or have it flush with the floor. 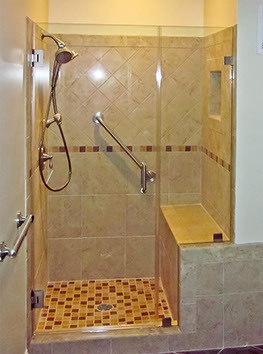 If you need a handicap accessible shower, then you'll want to make your shower flush with the floor – but keep in mind that having a curb does help prevent water from leaking or pooling onto the floor. 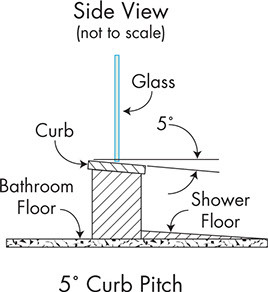 Also note that the top of the curb (where it meets the shower) should be a solid tile. 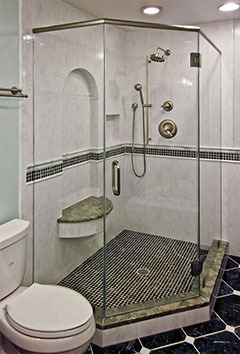 Water can collect in grout lines or horizontal tile, resulting in the growth of mold. 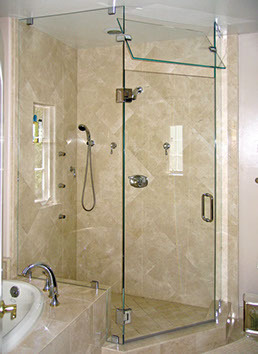 A transom is a panel with hinges on the sides that closes the area at the top of the shower by making the shower flush with the ceiling. 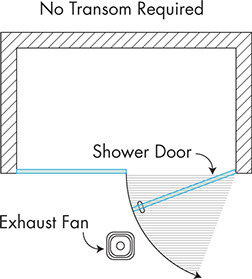 The transom is used to control the temperature and moisture level in your steam shower. 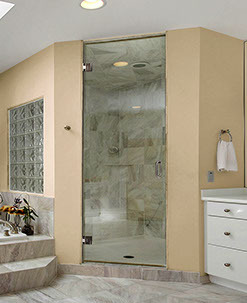 When you open the transom, it lets the heat and moisture out of your shower and cools it down. 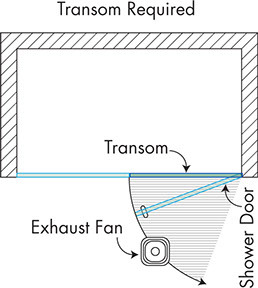 When closed, the transom keeps the heat and moisture in, creating steam. 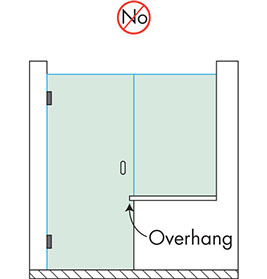 Make sure the transom won't be hampered by anything installed on the ceiling when it swings open. 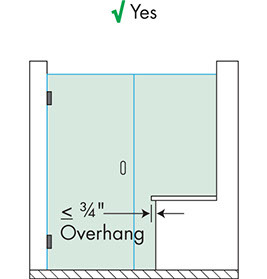 If an exhaust fan, vent or light fixture is placed in the path of the swinging door, a transom may be required to give the door clearance. 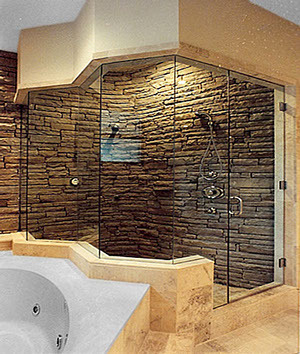 Knee walls are a functional or sometimes decorative element of your shower design. 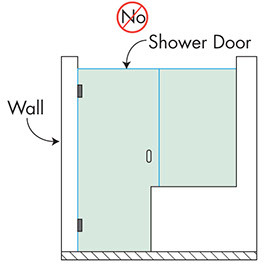 If you are replacing your shower, it is likely that your knee walls (also called a half-wall or “buttress”) are already there. 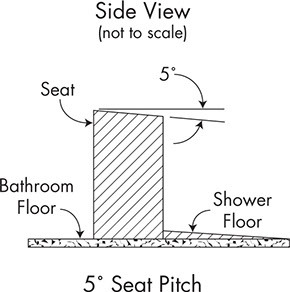 Many times, the knee wall is an extension of the side of your bathtub or a shower seat. 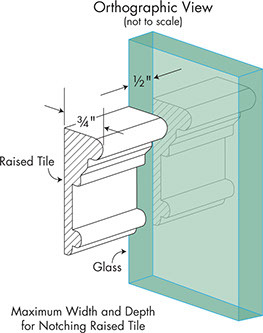 The top of a knee wall will be made of glass. 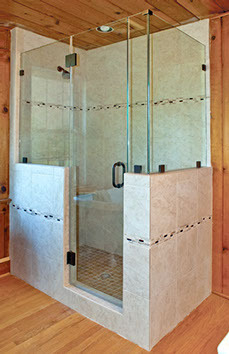 If your shower includes a knee wall, it is better to include in-line panel in your design. 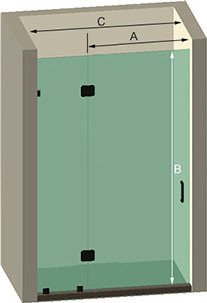 That way, you can modify the fixed panel to accommodate the knee wall instead of trying to modify the door. 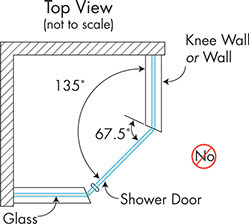 In other words, the swinging shower door cannot be notched to accommodate the knee wall. 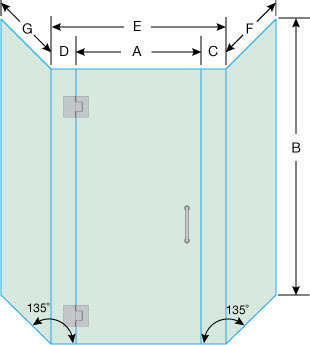 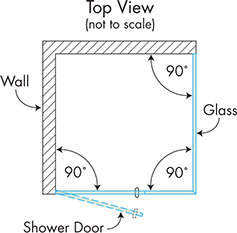 If you are putting in a neo angle shower enclosure that includes a "knee" wall or wall, make sure that the shower door meets the structure at a 90 degree angle to accommodate the requirements of the hinges. 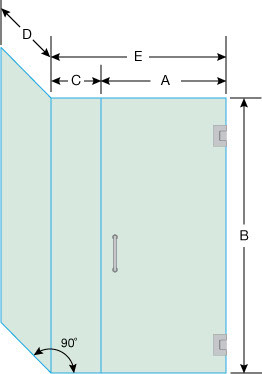 This is not a restriction when glass meets glass at the 135 degree angle. 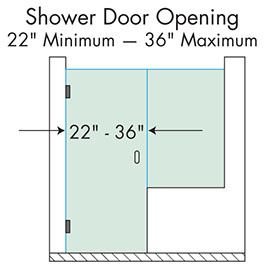 Please note that the shower door itself must be between 22" and 36" wide. 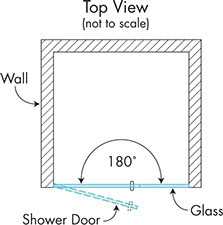 When planning your shower enclosure, keep in mind that each glass panel needs to be at least 5 1/2" wide, which is the minimum width for tempering glass and supporting the hardware. 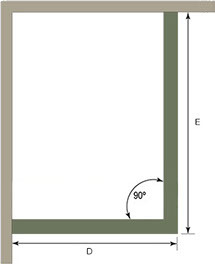 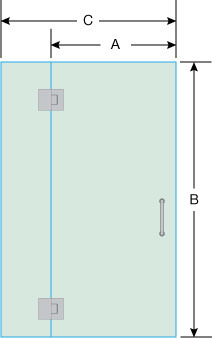 Also, the door will need to be a minimum of 22" wide and no more than 36" wide. 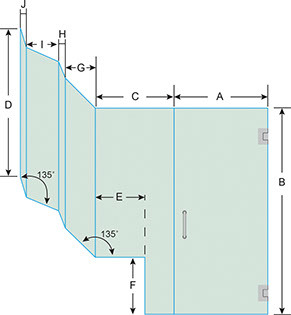 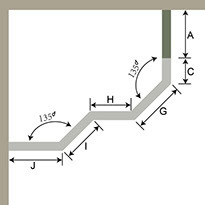 Plan for your shower to be built using 90°, 135° or 180° angles. 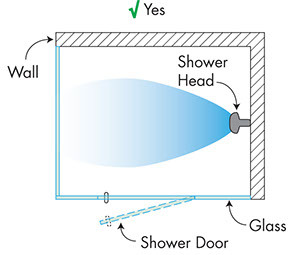 Most shower hardware is designed to accommodate these angles, so planning your shower with this in mind ensures a more cost-effective installation and properly functioning enclosure. 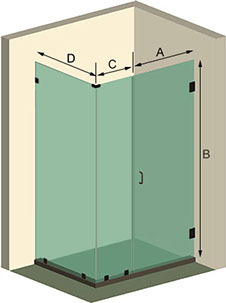 The neo angle shower must meet the structure at a 90° angle to accommodate the requirements of the hinges. 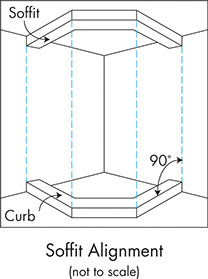 Glass can meet glass at a 135° angle without issues. 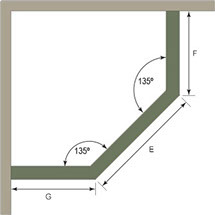 Make sure the soffits (or eaves) along the top line up perfectly with the angles in the curb below in order to avoid an uneven look. 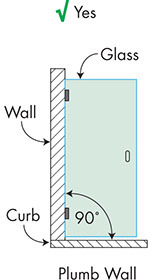 Walls which meet a door or glass panel need to be exactly vertical, or "plumb", in order to prevent gaps, uneven joints, and hinge "bind". 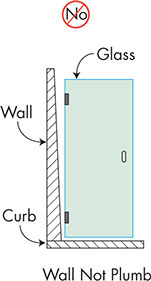 Walls more than 1/4" out of plumb cause unsightly gaps, are more likely to leak, and have a greater likelihood of hinge bind. 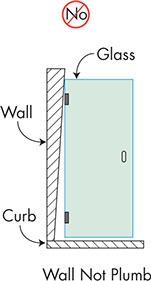 It is possible for us to work with walls that are no more than 1/4" out of plumb, as we can cut the glass "out of square" to accommodate the difference. 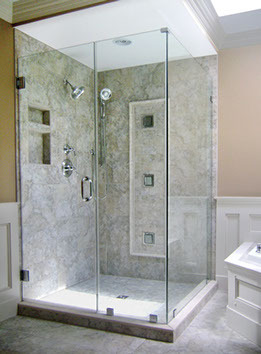 However, this will add cost to your shower, so making sure that the walls are constructed properly will save you time and money. 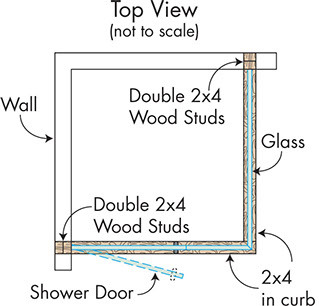 Be sure the wall on which you would like to install a hinged shower door has proper studding behind it (double 2x4 is best, though single 2x4 is acceptable). 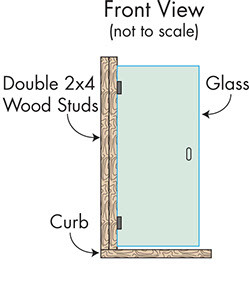 Always provide wood studs or blocking where doors hinge or panels are anchored, especially when metal studs were used in the original construction of the wall. 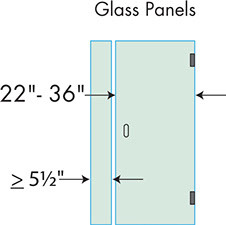 Avoid mounting door hinges and glass clips onto glass tiles, as the tiles can break during and even after installation. 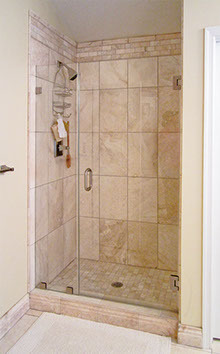 This can result in delays in getting the project finished and additional charges from the tile installers for repairs. 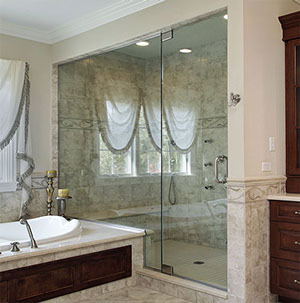 The tile or granite can be modified to allow for door operation, but filler might need to be applied, negatively impacting the look of the finished product. 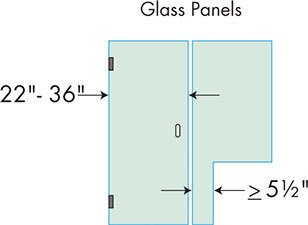 A better solution is to include a fixed panel in your design. 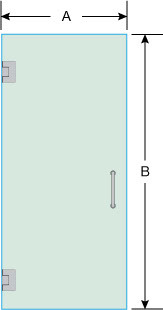 That way, the door can align with the panel on one side, opening and closing properly with no interference. 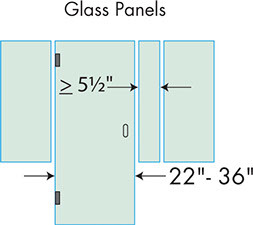 On the other side, the tile can be notched to allow the panel to line up flush against the wall. 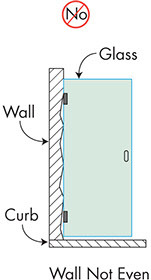 Keep in mind that solid pieces of tile, marble, or granite are best for the top of a curb. 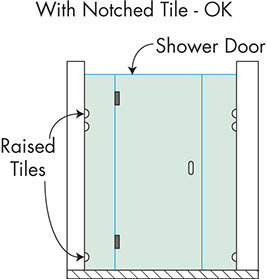 Tiled curb tops increase the likelihood of leakage and encourage the growth of mold or mildew because water collects in grout joints on horizontal tiles. 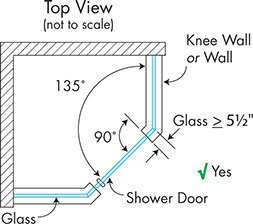 The shower door seal functions best on a smooth surface. 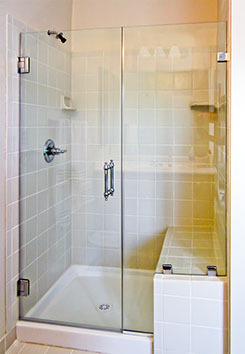 Increased likelihood of mildew and mold growth. 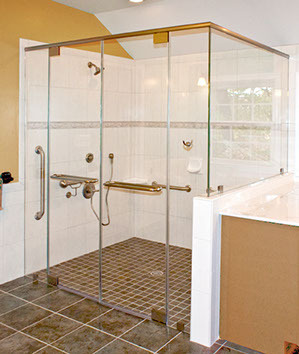 Now, your shower space should be ready for a stress-free shower installation! 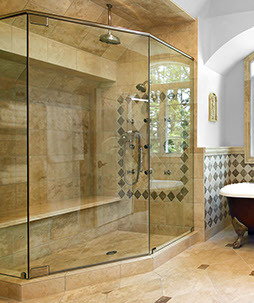 If you have any questions, please talk to a glass expert or call 1-866-452-7707.